I’ve been having fun with Instagram for a while now, but kept finding other things to write about. Anyway, it’s a fun app for the iPhone, and is kind of like Twitter, only for photos. When you’re happy with the shot, you can send it to Instagram, where followers can comment or “like” it. You can also send the photo to Twitter, Facebook and other social media. I don’t have the time to be really active, but it’s fun once in a while. You may recognize the eggplant and pears from my farmers market post of two weeks ago. You can see that here if you care to compare. Instagram only does square format, so you need to remember that when composing a shot. Oh, one more thing: there’s a company called StickyGram (http://stickygram.com) that will turn instagrams into magnets. They’re small, but very nice quality. 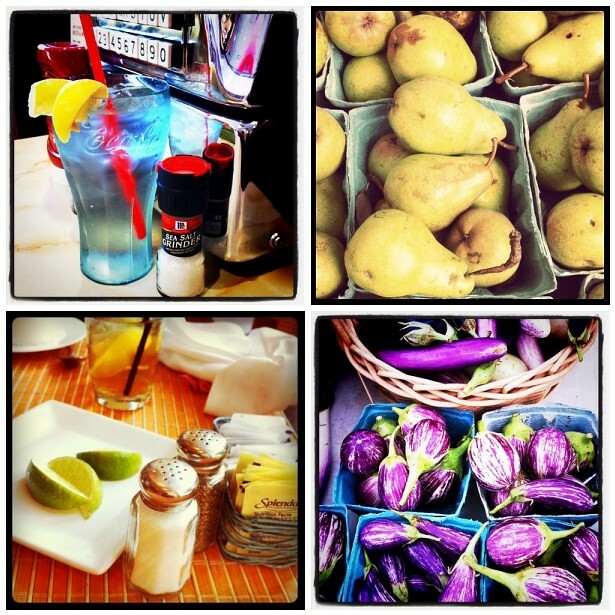 This entry was posted in photography and tagged Instagram, square format, StickyGram. Bookmark the permalink. I LOVE the pears ! Think I’ll drop by the local market to see if any are available. . . thanks for a ‘tasty’ visual treat. Thanks for explaining Instagram, Carole. Lovely mosaic. Thanks, Cheryl. Hope it made sense! Very interesting. The magnet idea is really neat. I like the four shots together but the eggplant is my favourite. The magnets are so cool, Caroline. The company is in England, but they got here quickly. I have been wanting to do this, but haven’t gotten around to it yet. I’m always behind on techie things.